Morris: Okay. What’s the password? Morris: The password is what? Morris: The password is exactly? Morris: The password is okay? Jerome: Far as I’m concerned. Morris: Damn it, say the password! Morris: Say the password, onion head! Jerome: The password is what? Morris: [frustrated] That’s what I’m asking you! Jerome: [more frustrated] It’s the password! Morris: The password is it? Jerome: [exasperated] Ahhhhh! The password is what! Morris: It! You just said so! Jerome: The password isn’t it! The password is? The Kid: I’d like to dedicate this to my father, Francis L. It’s a song the girls in the band wrote, Lisa and Wendy. Prince would have turned 60 today. Great job Roy (@rbutt14) and Claude (@claudeingle)!!! About a year ago I read Alan Light’s book Let’s Go Crazy: Prince and the Making of Purple Rain, and now, in the light of the recent tragic news of Prince’s death, I felt compelled to take a closer look at the music on the soundtrack. Honestly, anyone who reads this book would feel the same way. It has been an absolutely bittersweet night revisiting Prince’s classic album. It has always been one of my favorites and honestly got me through those difficult early high school years. Clearly, this album is nowhere near obscure – I would bet that many of you have it in your collection right now. It is one that I still listen to constantly and has mad an indelible mark on my life. Clearly there is nothing new I can say about this album’s greatness. There is no secret about the excellent critical reception or the sales figures, so let’s get those out of the way. After being released in June of 1984, the Purple Rain soundtrack sold 13 million copies (1.5 million in its first week of release). It was #1 on Billboard’s album chart for 24 consecutive weeks and spawned five Top 40 singles. The hit songs were “When Doves Cry” #1, “Let’s Go Crazy” #1, “Purple Rain” #2, “I Would Die 4 U” #8, and “Take Me With You” #25. Impressive, but consider the worldwide reception as well: it was a top 10 album in a total of thirteen countries and sold an additional 7 million copies. Purple Rain won a slew of awards and recognition, a sampling of these include: Rolling Stone’s ranking as the second best album of the ‘80s and #76 of the 500 greatest albums of all time, Time magazine’s ranking of 15th greatest album of all time, and VH1’s ranking of 18th on a similar list. The awards continue, but I think the picture is pretty clear- very few albums of any kind achieved the success of Purple Rain, making it one of the most influential albums, not just of the ‘80s, but of all time. That is plenty of background information, so let’s get to the songs. Like many of you I am now listening to these songs with an extremely heavy heart. Most of us are aware of the difficulty of finding a way to view Prince’s videos, so I tried to find some version of the songs. Dearly beloved, we are gathered here to get through this thing called life. Electric word, life, it means forever and that’s a mighty long time, but I’m here to tell you, there’s something else, the afterworld. A world of never ending happiness, you can always see the sun, day or night. So when you call up that shrink in Beverly Hills, you know the one, Dr. Everything’ll Be Alright. Instead of asking him how much of your time is left, ask him how much of your mind – cause in this life, things are much harder than in the afterworld. In this life – you’re on your own. (Believe it or not, I did that completely from memory). Most of us recognize this spoken word opening to this excellent hit song, and I cannot think of a better opening to any album I have heard. The first time I heard this I was floored and I knew that I was in for a unique musical experience. I had never experienced any song like this before. Prince continued with an extremely catchy rock song that ends with a blistering guitar solo that clearly displayed his virtuoso on this now staple of rock music radio and cover bands. This song helped define Prince as an artist who was not afraid to break down boundaries – yes, an African American musician could create rock songs and would not be pigeonholed as an R&B/Dance artist. This song remains one of all time crank-it-up-in-the car songs. This, like many of his song take on new meaning now. On the surface this song seems like a typical song about a guy wanting a girl who cannot decide on what she wants. As Prince frequently does, a subtle, deeper meaning is just under the surface. He slides in these lines: “Paint a perfect picture / Bring to life a vision in one’s mind / The beautiful ones / Always smash the picture / Always every time.” A seemingly simple song about desire now becomes a critical examination of those ‘beautiful’ people who have everything at their disposal, but are unable to make a decision about what they want or need. This song begins with a somewhat rare appearance by Revolution musicians Wendy Melvoin and Lisa Coleman making a vocal contribution. Lyrically, this song is a bit sparse; the music is where this one shines. Bass, keyboards, and guitar all combine for a musical exploration of the constant search for a meaningful relationship – and once again, the guitar work is excellent. This song melds perfectly into the next track. This was the song that started it all. I clearly remember that summer- my best friend and I were about to begin our sophomore year of high school, which was the first year in the actual high school building (we had a traditional 7th – 9th grade junior high). We were brash and cocky pretending to not be scared out of our minds. The third member of our best friend group was two years younger, so we were definitely posturing for him. This song became ‘ours’ that summer – the music, the lyrics, the chorus, everything spoke to us. We were so captured by our first listen of this song that we spent the rest of the weekend memorizing it, wrapping our lives around it, and, at the time, not realizing that it was becoming a song that represented us. When the three of us have our annual reunion (this year in June for my oldest son’s wedding) When Doves Cry is played and we strengthen the bonds we forged over thirty years ago. This song is another example of a perfect pop song. In the lyrics, Prince begins to explore a theme that will become a constant presence in his later music – spirituality. He uses words like “sinner”, “evil”, and “messiah” to explore the connections between religion and earthy love. Living in Europe in the ‘8os, I never had an opportunity to watch much MTV. When I moved back to the U.S. for college I overdosed on music videos. One video that captured my attention was a live version of this song. I could not believe that energy that Prince gave to this song. This is yet another example of Prince writing a catchy pop song; this time, though, he seems to be predicting the fame that this album is going to bring him. It was almost as if he realized the greatness of the music he was creating. As it turns out, he was absolutely right. Oh my, I am not sure I will be able to write about this song in the manner it truly deserves. There is a cover band from Omaha that travels about 150 miles west to the town where I live. They are named Hi Fi Hangover and I make a great effort to see them each of the four or five times per year they perform locally. They play an excellent variety of ‘80s and ‘90s hits, but I go for one reason- during the third set the sweet sounds of Purple Rain emanate from the amps on the small stage. They perform this song with the heartfelt emotion it deserves- and the guitar, oh the guitar! Prince is constantly changing his musical style to avoid being labeled, but this song has to be part of what defines him as a true artist. This is easily one of my all time favorite songs. This album holds special memories for me. It was the music that my best friends, LeRoyce and Marvin, and I listened to the most. 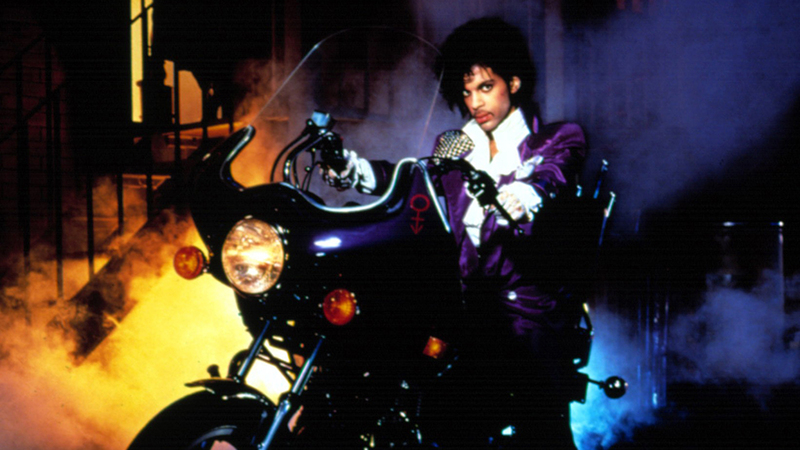 For a few solid months Purple Rain literally played non-stop on our dual cassette player. It was on while we played video games, in our walkman during subway rides, and in the boom box while we shot hoops. Listening to this album dozens of time today, has transported me back to those intensely carefree days of my teenagehood. Many times today I listened to these amazing songs with my eyes closed and I was transported back to those days, singing every word, clapping my hands, and bouncing to every groove – absolute perfection! The music industry considers Purple Rain to be one of the most important albums ever recorded, I consider it to be the most important album of my youth. The songs on Purple Rain are typical Prince. By typical I mean each song explores a somewhat different style of music and lyrics. As evidenced by songs like “1999” that preceded Purple Rain and “Raspberry Beret” and “Kiss” that follow it, Prince never stopped experimenting with his sound. Purple Rain is an amazing stop on the constantly evolving Prince creative train; this album represents a magnificent example from one of the ‘80s true musical giants.